Apps Have More People Tuning In To Police Chatter When Disaster Strikes : All Tech Considered The Las Vegas mass shooting and the California wildfires are the latest incidents that have drawn listeners to apps allowing the public to listen to police and fire frequencies. Why do people do it? 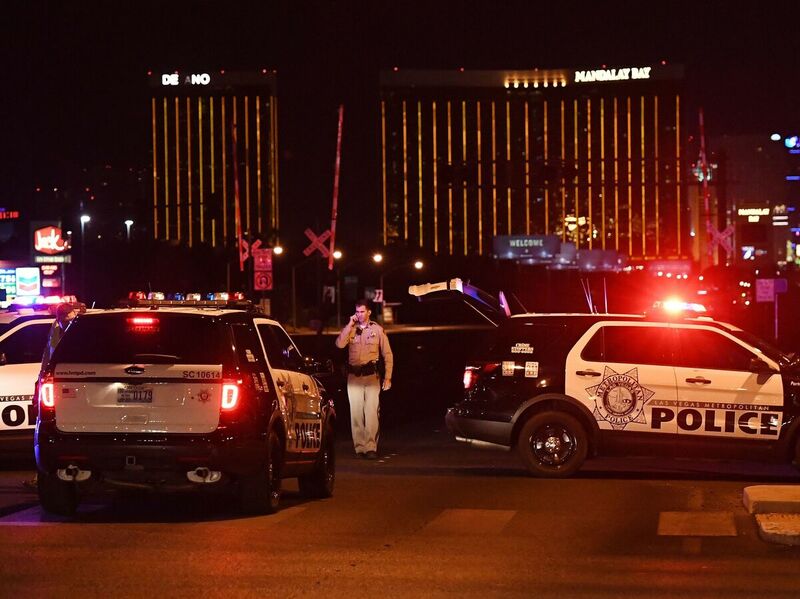 The mass shooting in Las Vegas this month was one of the latest incidents to draw listeners to apps allowing the public to listen to police and fire frequencies. When Floyd Conrade heard gunshots just above his Las Vegas hotel room the night of Oct. 1, one of his first reactions was to turn on a police scanner app on his phone. He wanted to know what was happening. "The whole feeling of not knowing what was going on was keeping me at bay, I guess. I have a scanner app on my phone. I tuned it in and listened to scanner activity," Conrade told The New York Times. "I couldn't tell exactly what was going on. I did hear on the scanner that an officer was shot." Many others were doing the same that night during the massacre that killed 58 people and injured hundreds of others. About 75,000 people were tuning in to Las Vegas police radio communications on Broadcastify, an online platform for scanner radio communication streams, according to the company's CEO, Lindsay Blanton. "Police scanner" was featured among the most searched-for phrases on Apple's App Store, even days after the shooting. For years, hobbyists, journalists and others have been tuning in to public safety radio in the U.S., where most channels are open to all ears, using actual scanners. But in recent years, with the increased popularity of online streaming and scanner apps, police radio chatter has become more accessible to the public. Why do people listen? Those open frequencies — unorganized and sometimes uncomfortable to hear — are drawing attention in the wake of the high-profile shooting and the multiple natural disasters in the past few months. Susan Lindberg of Utah, a former Bay Area resident, was following the Northern California wildfires closely from the beginning by tuning in to local fire departments' frequencies on her app. "They evacuated Calistoga today, one of our fav places. We've been in tears on and off all day," she tweeted. "Firefighters are amazing." Diana Penn of Texas says she has returned to listening to police radio in light of recent events. For her, the most important reason for tuning in usually involves loved ones. "I ... have a teen boy who drives, and an elderly mother who is going blind and shouldn't be driving," she says, so she monitors a scanner app for auto accidents. Public safety radio channels in several Northern California counties topped the list of top feeds on Broadcastify.com on Oct. 12 amid the region's massive wildfires. "Whenever a major incident happens in the country regarding public safety — either police, fire, EMS — we'll see a significant uptick of folks that will go to Broadcastify to listen in real time to what's going on," says Blanton. There is no general demographic information that shows who listens to the apps, but Allen Wong, the developer of 5-0 Radio, one of dozens of scanner apps available, says some of the heaviest users of his app are news reporters, retired police officers and relatives of police officers and firefighters. They also include concerned citizens worried about their neighborhoods, people stuck in natural disaster areas and hospital staffs preparing emergency rooms immediately after major incidents, he says. "People like the app for different reasons," Wong says. "Some want to listen to it out of curiosity. Some listen to it for reassurance that things are under control. Some listen to it for the thrill of it, like watching a reality show live." In some cases, people use the apps to try to help police. Penn, a disabled veteran, says she heard about an elderly man with dementia wandering toward her neighborhood. "I brought my phone [with] scanner app on, and went for a walk to see if I could find him." She says she was unable to locate the man but the police later did. But public interference in police activities is discouraged. Some agencies argue that information gleaned from scanner feeds can sometimes complicate their operations. One obvious concern is the potential for suspects listening in while they're being sought by authorities. During the manhunt of the 2013 Boston Marathon bombing suspects, Broadcastify temporarily took its feeds of area law enforcement offline to protect authorities' efforts. Some police departments may decide to encrypt their radio transmissions during investigations or special circumstances, but agencies generally aren't rushing to do it, Broadcastify's Blanton told NPR last year. "Agencies understand that what we do is legal, and there's not much pushback," he added. Yu-Ning Aileen Chuang is the Business Desk intern.